Project Summary – brief description of the New England SMS Project. Memorandum of Understanding on the New England SMS Project – principles under which all six states agree to use a single, regional SMS Plan in response to an outbreak of FMD, signed June 3, 2014. Overview of the New England SMS Project – presentation for the joint annual meeting of the Northeast Association of State Departments of Agriculture (NEASDA) and Northeast US Animal Health Association (NEUSAHA), June 5, 2012. 2015 Update of the New England SMS Project – presentation for the annual meeting of the Northeast US Animal Health Association (NEUSAHA), April 27, 2015. 2014 Update of the New England SMS Project – presentation for the annual meeting of the Northeast US Animal Health Association (NEUSAHA), May 12, 2014. New England Perspective on Planning Movement Control and Continuity of Business – presentation for the USDA-APHIS "National Dialogue on FMD: Planning Movement Control and Continuity of Business," November 3, 2011. Abstract of FMD as a Hazard for New England Dairies – one-page summary of the regional vulnerability assessment, June 30, 2011. FMD as a Hazard for New England Dairies – overview of regional dairy operations and assessment of their vulnerability to FMD, with documentation, June 30, 2011. Assessing Farm Readiness for Emergency Milk Movement in New England – brief description of a NESAASA's effort to identify the capacity of dairy farms in the region to meet biosecurity requirements for shipping milk to market during a FAD outbreak., August 1, 2014. Readiness Rating for Continuity of Dairy Operations in a FMD Control Area – poster for the 7th International Symposium on Emerging and Re-emerging Pig Diseases, Kyoto Japan, June 21-24, 2015. Dairy Farms That Touch the Public and Plans for Coping with FMD in New England – assessment of the importance of direct-to-consumer trade for regional dairies, attendant vulnerability, and strategies for reducing risk of disease transmission in an outbreak, January 18, 2013. New England as a Jurisdiction for Supporting Continuity of Dairy Operations – a reassessment of the six-state focus in this SMS project, in light of more detailed, comprehensive, and up-to-date information, with special attention to the Federal Milk Order and New York, December 30, 2013. New York Suppliers, Routes, and Strategies for Continuity of Dairy Commerce in New England – analysis and recommendations to sustain shipments of unpasteurized milk from New York to New England in an animal-disease emergency, January 20, 2014. Policy Toward Dairy Farms with Swine – analysis and SMS implications for dairy farms with pigs, March, 2014. Using a Hose to Improve Farm Biosecurity During Milk Pickup in a FAD Emergency – rationale and procedures for a using an on-farm hose to move milk to a tanker, parked at a safe distance from the milk house, when picking up milk in a Control Area in New England. Trends and Tactics for Sustaining Dairies in New England: An Update – presentation for the annual Leadership Meeting of the New England Veterinary Medical Association (NEVMA), September 27, 2013. 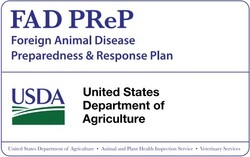 Updating Weights of Criteria in the Readiness Rating – integrating contributions from associates of the Centers for Epidemiology and Animal Health (USDA-APHIS-VS CEAH) in the calculation of SMS readiness in New England, August 1, 2014. Notes on Using NESAASA Data – step-by-step instructions on how officials can access and use information on New England dairies in an emergency, August 1, 2014. Readiness of New England Dairy Farms for SMS – A snaphsot of dairy production and biosecurity capabilities, to help anticipate ways that various minimum Readiness Ratings would affect continuity of dairy operations in a FMD Control Area, August 1, 2014. Progress in Readiness Reviews – update on coverage of NESAASA database, February 26, 2014. Lessons Learned from Recent Outbreaks of Highly Contagious Livestock Disease – January, 2017. Disease Risk Management Capabilities of Livestock Handlers on American Farms – information on the ability of farm employees to meet stakeholder expectations for the prevention and response to disease outbreaks , September, 2017. Economic Perspectives on Management of Livestock-Disease Emergencies – February 23, 2017. Biosecurity in Agriculture – Perspectives from Social Science – July 19, 2017. A ‘Readiness Rating’ for Balancing Biosecurity Priorities in FMD Preparedness and Response – slides from a presentation to OS'16, the Open Session of the European Commission for the Control of FMD (EuFMD), a commission of the Food and Agriculture Organization of the United Nations) in Cascais, Portugal, October 26, 2016. On-line video. Biosecurity, Infection Control, and Continuity of Dairy Operations in FMD Response: A New England Perspective – analysis of ways to sustain dairy operations in an outbreak, particularly biosecurity requirements for allowing farms to ship milk to processors, and a defense of variants like the New England SMS Plan, August 1, 2015. Farm Biosecurity: A Reassessment of Feasible Benefits in an Outbreak – Slides from a presentation to the Committee on Foreign and Emerging Diseases at the USAHA Annual Meeting, October 27, 2015. Communicating with Dairy Consumers about FMD – guide to risk communication, April 2013.